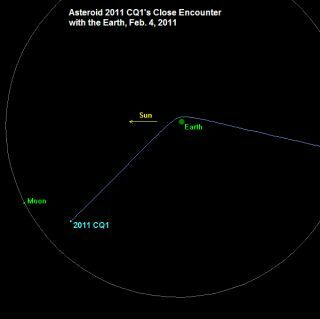 This NASA graphic depicts the new flight path and trajectory of asteroid 2011 CQ1 after its Feb. 4, 2011 encounter with Earth. The tiny asteroid flew within 3,400 miles (5,471 kilometers) of Earth – a new record. A tiny asteroid that zipped by Earth this month made the closest-ever approach to our planet without hitting it, an encounter that changed its place in our solar system forever, NASA scientists say. The asteroid, called 2011 CQ1, came within 3,400 miles (5,471 kilometers) of Earth on Feb. 4. Astronomers with NASA's Near-Earth Object office now say the flyby set a record for a space rock. "This object, only about 1 meter in diameter, is the closest non-impacting object in our asteroid catalog to date," wrote astronomers Don Yeomans and Paul Chodas in a post-flyby analysis. Both scientists work in the NEO office, at NASA's Jet Propulsion Laboratory in Pasadena, Calif.
Asteroid 2011 CQ1 was discovered only 14 hours before its close approach, which occurred over the mid-Pacific Ocean, but it never posed a threat to the planet because of its small size: 4 feet (1.3 meters) wide. Had it entered Earth's atmosphere, it would have broken apart before reaching the ground, NASA scientists said. The asteroid's flyby of Earth has changed its orbit, according to Yeomans and Chodas. But during the Feb. 4 flyby, Earth's gravitational pull warped the flight path of 2011 CQ1. Now the asteroid will spend "almost all of its time inside the Earth's orbit" in what scientists call an Aten-class orbit, explained Yeomans and Chodas. The Earth's gravity pulled asteroid 2011 CQ1 about 60 degrees off its original flight path, they added. Asteroid 2011 CQ1 was the first of two asteroids to zip past Earth within a span of six days. Another space rock – the car-size asteroid 2011 CA7 – came within 64,300 miles (103,480 km) of Earth when it passed by on Feb. 9. Astronomer Richard A. Kowalski of the Catalina Sky Survey discovered asteroid 2011 CQ1 just before its flyby, and scientists at Remanzacco Observatory in Italy snapped a photo of the object ahead of the close pass. NASA and other scientists monitor the skies for asteroids or comets with orbits that cross that of the Earth in order to track near-Earth objects that could pose an impact threat to our planet. Tiny asteroids like 2011 CQ1 are difficult to spot but pose no threat to Earth. "There is likely to be nearly a billion objects of this size and larger in near-Earth space, and one would expect one to strike Earth's atmosphere every few weeks on average," Yeomans and Chodas wrote. "Upon striking the atmosphere, small objects of this size create visually impressive fireball events but only rarely do even a few small fragments reach the ground." You can follow SPACE.com Managing Editor Tariq Malik on Twitter @tariqjmalik.